Powis Castle (Welsh: Castell Powys) is a medieval castle, fortress and grand country mansion near Welshpool, in Powys, Wales. It is known for housing the treasures that were brought home by Robert Clive and his son, Edward Clive from India. The Clives "looted" them during their service with the British East India Company. The castle has also been known as Castell Coch, Castell Pool, Castell Pola, Castell Pole, Castell Trallwng, Red Castle, Redde Castle and Castel Cough. The seat of the Earl of Powis, the castle is known for its extensive, attractive formal gardens, terraces, parkland, deerpark and landscaped estate. The property is under the care of the National Trust. Princess Victoria (later Queen Victoria) visited the castle as a child when her mother took her to tour England and Wales in 1832. Unlike the case of castles at Conwy, Caernarfon, Harlech and nearby Montgomery which were all built by the English to subdue the Welsh, Powis castle was built by a Welsh prince in the thirteenth century. Following the end of the Welsh Wars (1282) and for his loyalty to Edward I, the King permitted Gruffydd ap Gwenwynwyn to begin building Powis Castle circa 1283. In 1286, four years after Edward I’s conquest of Wales, Owain ap Gruffydd ap Gwenwynwyn, the last hereditary prince of Powis, renounced his royal claim title and was granted the title of Baron de la Pole, (i.e. "of the Pool" a reference to Welshpool, formerly called just "Pool" and the location of Powis Castle). 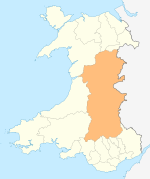 The ancient Kingdom of Powys had once included the counties of Montgomeryshire, much of Denbighshire, parts of Radnorshire and previously large areas of Shropshire, but by the 13th century had been reduced to two independent principalities - Powys Wenwynwyn and Powys Fadog - roughly equivalent to Montgomeryshire and South Denbighshire (plus Maelor Saesneg), respectively; Welshpool had latterly become the capital of Powys Wenwynwyn, of which Owain had been heir. On the death of Owain, the baronry passed to his daughter Hawise (known to history as Hawise Gadarn, the intrepid) who married Sir John Charleton. The Charletons continued to live at Powis until the fifteenth century when two daughters, Joan Tiptoft and Joan Grey inherited the castle. The Grey family took control of the whole castle in the 1530s. In 1578 an illegitimate son of the last Baron Grey of Powis, began leasing the lordship and castle to a distant relative - Sir Edward Herbert (d. 1595), second son of Sir William Herbert, 1st Earl of Pembroke. Edward eventually bought the castle outright in 1587 and started a connection between the Herberts and Powis Castle which would continue to the present day. Sir Edward's wife was a Roman Catholic and the family's allegiance to Rome and to the Stuart kings was to shape its destiny for over a century. On 22 October 1644 Powis Castle was captured by Parliamentary troops and was not returned to the family until the restoration of Charles II. The castle passed on to Robert Clive's son, Edward when the latter married Henrietta, a descendant of the original owners, and took the surname of Herbert for himself and his descendants. It continues to be owned by the Herbert (ex Clive) family, through the National Trust. According to William Dalrymple, much of the wealth amassed by Clive was loot that was illicitly collected after the Battle of Plassey. Much of it is today displayed at the Clive museum at Powis. When Clive returned to UK with ₤234,000 (₤ 23 Million today), he was the richest self-made man in Europe. The magnificent State bedroom was installed in about 1665 and further improvements were carried out during the 1670s and 1680s, possible under the direction of William Winde, who may also have designed the extraordinary terraced gardens. Winde's employer was William, third Lord Powis (c.1626–1696), who was created Earl (1674) and then Marquess (1685) of Powis. Barred by his Catholic faith from high office under Charles II, Lord Powis became one of James II’s chief ministers and followed his master into exile in 1688. Thereafter King William III granted the castle to the 1st Earl of Rochford in 1696. The second Marquess was reinstated in 1722, and on the death of the third Marquess in 1748, Powis was inherited by his Protestant kinsman, Henry Arthur Herbert of Oakly Park, Ludlow, who was made Earl of Powis by George II. On 6 July 1756 Lord Lyttelton wrote that "About £3,000 laid out upon Powis Castle would make it the most august place in the kingdom" and in 1774 Sir John Cullum remarked: "(Powis’s) grand situation, its charming and magnificent prospects, its extensive woody parks of many 100 acres (400,000 m2) … render it one of the first seats of the Kingdom." In 1784, Lord Powis's daughter, Lady Henrietta Herbert, married Edward Clive, the eldest son of Clive of India. Edward also worked in the East India Company and was then the Governor of Madras. Their marriage led to the union of the Clive and Powis estates in 1801, and in 1804 the earldom of Powis was recreated for the third time for Edward Clive. Powis Castle and Estates were inherited by Henrietta and Edward's eldest son (also called Edward Clive) when he turned 21. In accordance with his uncle's will, the younger Edward Clive duly changed his name to Herbert. The Clive fortune paid for long overdue repairs to the castle which were carried out by Sir Robert Smirke. The garden and park were also improved. Part of Clive's collection from India including fine old master paintings, the wealth amassed after the Battle of Plassey and the Battle of Serirangapatnam, French and English furniture, and Italian curiosities, were brought to the castle. These include Tipu Sultan's magnificent state tent, made of painted chintz; a gold and bejewelled tiger's head finials from Tipu's throne; and two cannons that are today positioned on either side of the castle entrance. The final alterations to Powis Castle were undertaken at the beginning of the 20th century by G. F. Bodley for George Charles Herbert, 4th Earl of Powis (1862–1952) whose wife improved the garden which she felt had the potential to be `the most beautiful in England and Wales’. She died after a car accident in 1929 and Lord Powis also lost his two sons (and heirs) in the First and Second World Wars. In the latter war, the Welsh Girls' School was evacuated to the castle from Ashford, Middlesex. On his death in 1952, he bequeathed the castle and gardens to the National Trust. He was succeeded by his cousin, Edward Herbert (1889–1974), fifth Earl, whose widow, the Countess Powis, remained living in the dower house, and was succeeded in turn by Christian Victor Charles Herbert the sixth Earl. The Clive Museum features artifacts collected from Bengal, and other parts of modern-day Bangladesh, India by Robert Clive (1725–74) and his son and daughter-in-law Edward, 2nd Lord Clive (1754-1839) and Lady Henrietta Clive (1758-1830) in the 18th and 19th centuries, including textiles, silk, fine bamboo, magnificent hand woven carpets, refined jute handicrafts, armour, weapons, bronzes, gold and silver pieces, jade, ivory, and a formal tent. There is a rich archive of documents connected to the collection, but little is known about their acquisition. "Much must have been obtained as booty, or as presents from the native princes...". The collection came to Powis Castle in 1804. The current museum opened in 1987. The castle contains the portrait Henrietta Clive, Countess of Powis (1758–1830), painted in 1777 by Sir Joshua Reynolds. The Countess was daughter of Henry Herbert, 1st Earl of Powis and wife of Edward Clive, 1st Earl of Powis. The hat and the lace scarf which she wears in the portrait are not shown in the engraving of 1778 (hung nearby) and appear to have been added by another hand. A remarkable survival of the 1660s, the State Bedroom is the only one in Britain where a balustrade still rails off the bed alcove from the rest of the room. Such a design derives from the days when the English gentry wished to emulate the elaborate etiquette that regulated the court of Louis XIV at Versailles. When improvements to the castle were being considered in 1772, the architect Thomas Farnolls Pritchard recommended that the bedroom be wholly preserved. A visit to the castle by Charles II is still part of the family tradition. The window latches in the shape of the Prince of Wales's feathers commemorate the visit of the future King Edward VII. His son and daughter-in-law (later King George V and Queen Mary), visited in 1909. Displayed in the Long Gallery, the marble group of a cat and snake, is Roman and dates from between 1st century BC and 2nd century AD. Representations of cats are rare in Roman art and the Powis group is unique amongst surviving classical sculpture. Two similar compositions in mosaic are known, from Pompeii and at the Vatican Museum, but these both depict a cat attacking a bird. It seems most likely that the marble was purchased by Clive of India for his wife on his visit to Italy in 1774. The marble was quarried on the Greek island of Thasos and is distinctive for the large embedded crystals which make sculpting difficult. The castle and its terraces viewed from the south-east. The terraced gardens are still defined by the yews, often trimmed into abstract topiary, planted in the 18th century or earlier. The garden at Powis has survived the 18th century reaction against the formality of earlier garden design, and Powis is thus one of the few places in Britain where a true Baroque garden may still be fully appreciated. It seems the terraces were hewn from the rock in the early 1670s under the direction of Frenchman Adrian Duvall of Rouen, although William Winde may also have been involved, up until his death in 1722. The concept for formal or terraces was introduced into northern Europe from the gardens of 16th century Italy. It seems that Duval may well have been an expert in hydraulics, having been principally responsible for the impressive original water gardens, which were dismantled by 1809. One notable item salvaged from the garden fountains is the lead statue of "Fame", attributed to the workshop of Dutchman John van Nost (d. 1729), and now situated in The Courtyard. The piece seems to have been struck from the same mould as the Pegasus and fame supplied by van Nost between 1705 and 1716 to Sir Nicholas Shireburn at Stonyhurst, Lancashire. A great deal of work to restore and improve the gardens was undertaken in the early 20th century by Violet wife of the fourth Earl. Her most considerable achievement was the relocation of "the entire kitchen garden, glasshouses and all, to a new position behind the Wilderness ridge", and the laying out of the formal gardens at the far south eastern corner. ^ "The Clive museum at Powis". www.nationaltrust.org.uk. National Trust. Retrieved 8 June 2017. ^ "Powis Castle". Gatehouse Gazetteer. Gatehouse Gazetteer. Retrieved 23 April 2015. ^ a b c "The Clive Museum at Powis". www.nationaltrust.org.uk. National Trust. Retrieved 8 June 2017. ^ a b c Dalrymple, William (4 March 2015). "The East India Company: The original corporate raiders". The Guardian. Retrieved 8 June 2017. ^ Kennedy, Maev (28 June 2016). "Somme trench recreated in Welsh castle to salute battle's centenary: Powis Castle exhibition inspired by heir's death will be among scores of events in UK and France marking first world war battle". The Guardian. Retrieved 29 June 2016. ^ The Complete Peerage, Volume X. St Catherine's Press. 1945. p. 655. Wikimedia Commons has media related to Powis Castle. This page was last edited on 7 April 2019, at 21:16 (UTC).